While I was traveling I kept a million and one little tips about traveling, packing, places to stay and eat, and the best way to travel on my phone, and now that I'm settling back into school I thought I'd turn some of those into blog posts. Here are a few of the tips I wish I'd learned before I left, but hindsight is always 20/20, and I hope these help some of you out! 1. Plan Ahead// Before I left I kept everything I wore in one pile, seperate from my other clothes. I did that for about a month and then knew that's what I'd need to pack first, as those things were my "clothing necessities." I would've been fine just sticking to those things, but I continued to add more things as I went through my closet and packed things I never really wore at home because I thought that I 'might' wear it in England. Don't do that. If you don't really wear it at home, you won't wear it there, I promise. 2. Research//Seriously. I know it sounds weird to do packing research, but it helps so much. Luckily I had someone where I was going who could tell me about the weather, what to pack for class and nights out, and on and on, but not everyone has an Amy, so use Pinterest for all it's worth. There are TONS of itemized packing lists and if you're a list lover like me it'll be everything you ever wanted.3. Make a Packing List//Y'all, this is probably the most important. Not only will you over pack if you don't have list to check off, but you also might forget some pretty vital stuff. Coming from the person who almost always forgets underwear and a toothbrush, save yourself the trip to Victoria's Secret/CVS (and the money to replace them), and just make a list. It's cuts down on the stress in an already stressful situation. 4. Layer, Layer, Layer//I cannot stress this one enough. I brought tons of thick sweaters and multiple coats and wore maybe about a third of what I brought. It's so much better to bring t-shirts, cardigans, light sweaters, and flannels, because you won't want to wear thick sweaters all the time. First off, if you're going somewhere cold, it won't always be cold, so you'll want a few lighter options, but also, you can mix and match layered things much easier than big sweaters, so you';; get more outfits out of them. 9 times out of ten I wore a t-shirt, hoodie, and a coat, and left my wool sweaters in my closet, so in hindsight, I should've left them at home. Also, when going to class or just hanging out in my dorm, I stuck to t-shirts and casual things...which I should've brought more of, being that they're lighter and easier to layer, instead of chunky sweaters. If you're going somewhere warm, this may not be as big of an issue, but I'd still say pack mix and match pieces, not shirts that only go with one pair of shorts and vice versa. 5. Pack it, Weigh it, Pack Again//The struggle to get my suitcase under 50 pounds was so real. With my necessities, my suitcase easily closed and I didn't have to worry about the weight. But once I added half of my closet? Not even space bags could help me. Finally, I unpacked enough to zip it shut, weighed it, took out enough to get it under the weight limit, weighed it again, and then finally organized the stuff that made it onto the final packing list. If I had waited to weigh it until I got to the airport I would've been in deep shiitake mushrooms. 6. Pack Lighter than the Limit// This one's the hardest for me. I want to pack everything right up until the 50 pound mark because you just never know what you might need and if at all possible I want to prepare for everything, but you just can't. You have to take in to account that you're going to want to shop while you're away, but not only that, you'll have keepsakes that you'll want to bring home too, and if your suitcase is already maxed out, you're going to run into tons of fees trying to get it home. I know this because I had to pay for two overweight bags on my flight home from Heathrow and it just about killed me...although my Wills and Kate mug did make it home safe and sound. (; 7. Bring a backpack//Not only is a backpack easier in the airport - less to hold in your arms and much more manageable than a heavy shoulder bag - but it's also seriously a life saver on weekend trips. Not all budget airlines allow a carry on, much less a checked bag, so packing in a backpack as both a suitcase and a purse cuts down on cost and makes things much easier. It's got pockets for everything too, and just feels so much more "backpacking around Europe" than a rolling suitcase. Trust me, when you're running for a train, trying to navigate a foreign airport, or trekking through town to find your hostel, you'll want your hands free. Misc. Tips: Try to get suitcases that are expandable. You may not need it now, but three months from now, you're going to need it. Space Bags are great, but they don't help with weight, so don't go overboard. This isn't the post office...just because it fits, doesn't mean it ships. (and airport security are really mean) Make sure you know the liquid limits before you fly. I had so many things thrown away and had to repurchase them because the rules are different for different countries. 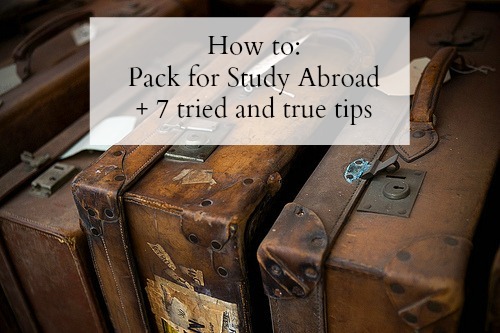 Hope these tips helped if you're packing to go abroad soon! I'm slowly trying to compile everything I learned into blog posts, so keep your eyes peeled and have a great rest of the week! These tips are all so accurate!! I studied abroad in London during the summer and I wish I packed less clothes. I ran into many fees at Heathrow too. my golden rule, that i STILL do not apply myself when i'm packing my big suitcase is to underpack. always remove one item. usually if i've never worn something in the comfort of my hometown, it's unlikely i will wear it while in a new place.